Always the best treat!!! 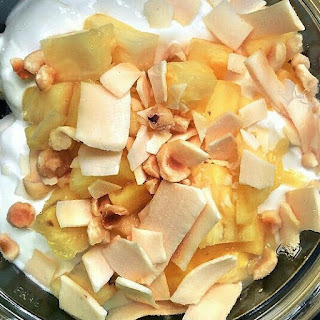 Chobani yogurt with sliced pineapples, agave, macadamia nuts, and toasted coconut !!! Can be made at home & you can top with chopped nuts of your choice (pecans, walnuts, almonds, etc) if macadamias aren't your cup o' tea!!! My kiddos love this for a breakfast or afternoon snack! If you're following the 21 Day Fix, this is approved and equals 1 red (yogurt), 1 purple (pineapple or fruit of choice), 1 orange (nuts) & 1 gray (agave).